Democrats have fared well under Walsh’s leadership. John Walsh, who helped guide Deval Patrick to the governorship in 2006 and has overseen a Democratic grass-roots revival that provided a template for President Obama’s campaign, will step down from the party chairmanship this fall, according to a close political associate. Walsh will take over leadership of Patrick’s political action committee, Together PAC, as Patrick moves into the final stage of his governorship: one in which he fends off lame-duck status, as 2016 national ticket speculation swirls. While Patrick has played down any presidential ambitions, the move by a top lieutenant to his political action committee, which had more than $512,000 on hand at the beginning of the year, could prompt speculation that the governor has grander designs. funded political operation could help inoculate Patrick from the dangers of an enervated, late-stage administration. Walsh’s exit, together with Patrick’s at the end of 2014, could also pave the way for a smooth transition for the next party chairman. “He feels it’s better to move now before the 2014 election and let a new person come in,” the associate said. Walsh’s departure opens the top party post for the first time since 2007. While his successor will be chosen by a vote of the state committee, the state’s top elected Democrats — Patrick, Senator Elizabeth Warren, and Senator-elect Edward J. Markey — are expected to wield significant influence in recruitment. In 2006, Patrick’s Massachusetts team worked with Obama advisers David Axelrod and David Plouffe, who road-tested both a message and a campaign apparatus that would serve Obama well two years later. Axelrod has called Patrick’s efforts a model for Obama’s campaign. A longtime South Shore political operative who owns an Abington insurance business, Walsh came to prominence during Patrick’s unlikely 2006 gubernatorial bid, part of a small team that formed early in 2005 and helped the first-time candidate navigate the perilous shoals of Bay State politics. 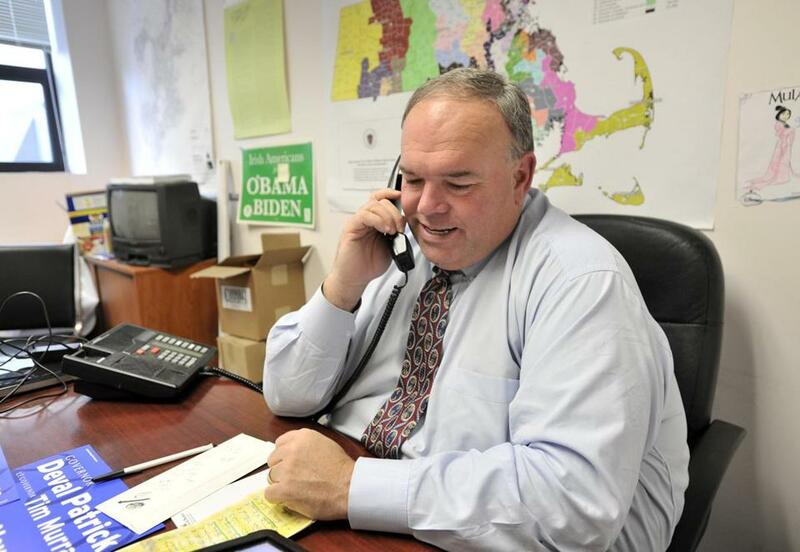 Coupled with Patrick’s often gauzy message of hope was the hard-bitten emphasis on organizing and face-to-face contact that Walsh had come to value while running local campaigns. The precinct-level electioneering, seeded in the 1970s and 1980s campaigns run by former governor Michael S. Dukakis, matured into the Internet age under Walsh. That focus has served Democrats well since then, as the party has continued its run of clubbing Republicans in statewide elections. After Patrick took office in 2007, his team formally took control of the party. Walsh replaced outgoing chairman Philip W. Johnston later that year. Begrudgingly, party operatives who were skeptical of Walsh’s insistence on grass-roots outreach have come to accept it as a party strength. The most notable blot on Walsh’s resume is the 2010 special election to fill the seat vacated at the death of Edward M. Kennedy. Republican Scott P. Brown stunningly defeated Attorney General Martha Coakley, a loss that embarrassed Democrats from Beacon Hill to the White House. Coakley’s campaign operation was largely self-contained, with party veterans, both in Massachusetts and Washington, kept at arm’s length until the desperate, closing days of the campaign, after Brown’s potential for victory became evident. Even so, Walsh and other top Democrats have accepted each election since as a grim chance for vindication. Since Walsh became chairman, the Brown-Coakley tilt has been the Democrats’ only statewide loss. The state’s US House delegation has stayed all-Democratic, and Democrats have retained a lopsided advantage in the Legislature. As Democrats gathered in Lowell for their off-year platform convention on Saturday, Patrick recalled how he had met Walsh in a coffee shop in 2005 to ask him to manage his campaign. Patrick said he had asked the burly veteran operative to take a chance on him, and Walsh complied. Walsh, too, sounded sentimental Saturday in recalling that, when Democrats met in Lowell eight years ago for a similar convention, a largely untested Patrick and his team put the party establishment on notice that a new way of doing things was in the wind. Reach Jim O’Sullivan at James.OSullivan@globe.com. Follow him on Twitter at @JOSreports.